If you or a loved one have been affected by I.C.E., please get in touch with me and/or the following organizations. If you live in Washington, have an order of removal, or have been checking in with I.C.E without consulting a lawyer click on the link above to fill out the form to get in touch with NWIRP or The Seattle Clemency Project. 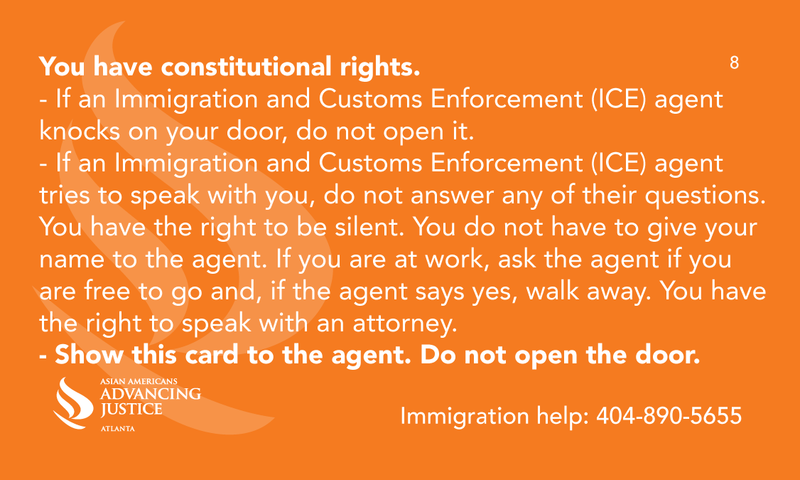 King County residents or those who work in Seattle in need of legal services for their immigration case call (206) 816-3870 to find out if you qualify. If you are interested in staying updated about ongoing organizing efforts against Southeast Asian deportation, locally and nationally, please fill out this google form. The information you provide will be used for the Vietnamese Anti-Deportation Network, and Southeast Asian Deportation Defense Network, to be able to follow-up with you with opportunities to engage and organize against Southeast Asian deportation. A community effort to advocate, support, and provide resources for our community members who are unfairly targeted by I.C.E. with orders of removal, detained, or deported in Washington State. 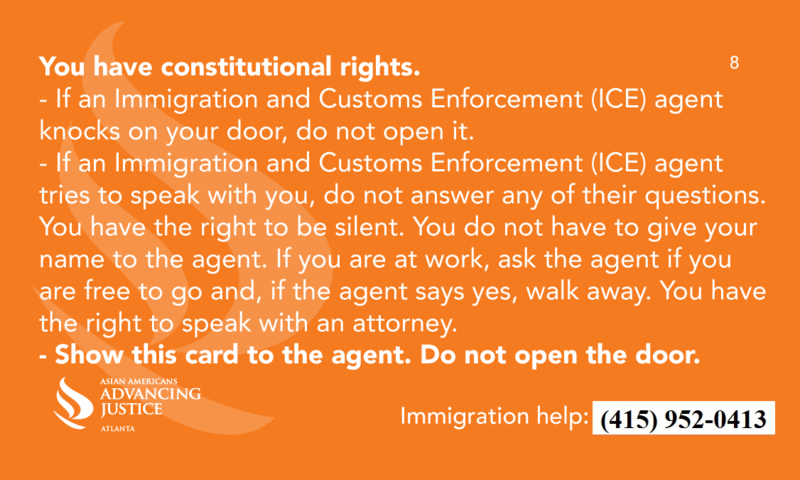 Immigration and Customs Enforcement (ICE) has carried out a series of devastating raids on Southeast Asian refugee communities. This website was created by non-profit and community organizations to provide resources and up to date information to people facing deportation to Cambodia, Laos, and Vietnam. SEARAC is a national civil rights organization that empowers Cambodian, Laotian, and Vietnamese American communities to create a socially just and equitable society. As representatives of the largest refugee community ever resettled in the United States, SEARAC stands together with other refugee communities, communities of color, and social justice movements in pursuit of social equity. 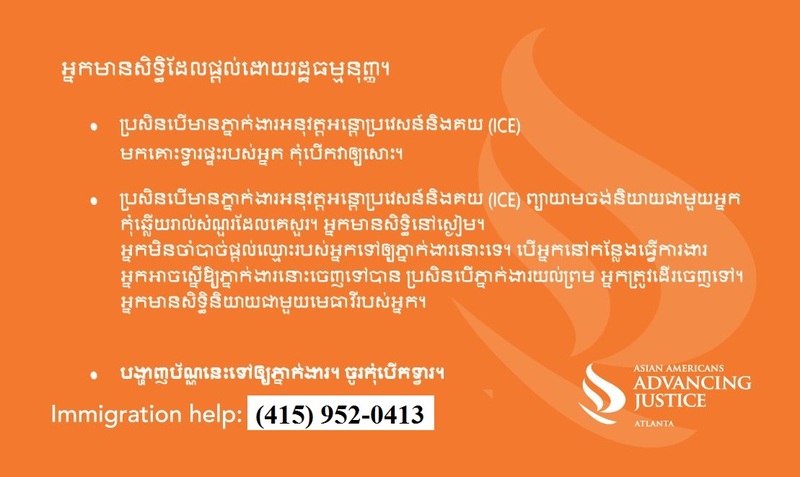 KVAO – a non-governmental humanitarian organization facilitating the integration into Cambodian society of people who were admitted to the United States as refugees and are being deported to Cambodia. F.I.G.H.T is an organization that assist, advises, and councils men and women of Asian Pacific Islander descent who are currently incarcarated or have been released. F.I.G.H.T is also highly active in the advocacy of preventing deportation among our community at large. The Seattle Clemency Project is committed to giving second chances to individuals involved with the criminal justice system. Partnering with various pro bono lawyers in Washington, we are the only non-profit organization in Washington focusing on using Clemency as a means of helping reformed individuals we believe would make positive impacts in our community if released. In the fall of 2010, 1Love Movement formed in response to a deportation crisis that targeted Cambodian-Americans with past criminal convictions in Philadelphia, PA. What began as a campaign to release loved ones from the prison and deportation systems, grew into a grassroots movement building organization. 1Love Movement continues to organize to address the root causes of migration due to US militarism and foreign policy, conditions of poverty, inter-generational trauma, the school to prison pipeline, and unjust deportation policy. We have made a grassroots impact on national policy reform while leading grounded strategies that have won local criminal justice and immigration policy change. NWDC Resistance is a grassroots undocumented led movement that works to end the detention of immigrants and stop all deportations. Under the umbrella of the national #Not 1More campaign, NWDC Resistance supports and follows the leadership of those detained at the Northwest Detention Center in Tacoma, Washington demanding better treatment and conditions and the stop to all deportations. As a movement we reject the paradigm that classifies immigrants as either “hardworking” or “criminal”, “worthy” or “unworthy.” Words like these seek to further divide our communities between people whose lives are considered disposable and people whose lives are judged worthy of protecting. We reject these divisions. And we will continue to organize, march, protest, and act against an immigration system that profits off of the separation of families and the exploitation of undocumented communities. #Not 1more means not one more.